I'm in the process of designing a house for a challenging lot which will require a garage suspended well above grade. The garage and part of the driveway rests on top of two steel beams with one end resting on concrete footings at the edge where the grade drops off and the other ends are supported on columns. 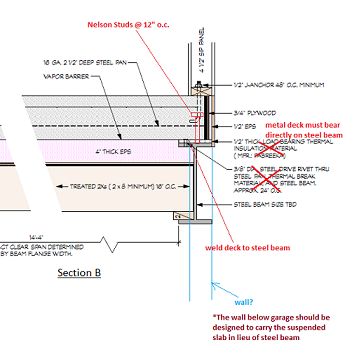 I've included a drawing which shows a steel pan floor in the garage and on the portion of the driveway that is above grade. The clear span of both steel pans is approximately 14'-4:". I plan on using a 16 Ga steel pan 2 1/2" deep with a 7 1/2" deep concrete pour in the garage and a 6" pour on the driveway. I've insulated the garage floor with 4" thick EPS supported by 1/2" plywood on 2X joists. These joists are meant to support the plywood and insulation only, not the steel pan and concrete. Will this structure be enough to support the weight of the concrete and a 4000# vehicle? What rebar reinforcement would you suggest? Would i be able to have a floor drain at the center of the garage floor without affecting the strength of the structure? Is there anything about the details in the drawing that you would suggest changing? First the floor drain at middle of garage is not a good idea. It will be a pain to run pipes to drain the water and it will interfere with everything beneath the garage. The easiest is to raise one side of garage floor slab by 3 or 4 inches and let the water drain on top of driveway. The water coming to the garage is very minimal mainly trapped snow on your vehicle. concrete or steel columns. It is also unclear how high is the top of garage above the lower level basement or whatever beneath the garage. These are critical information for bidding as well as construction. 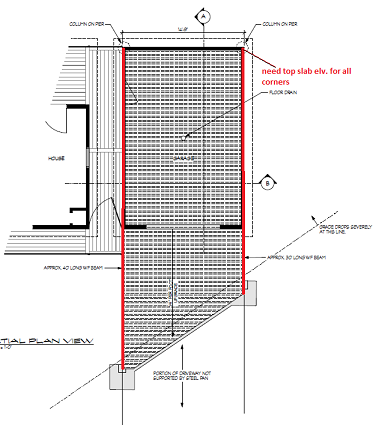 I have noted on plans that top of slab elevations need to be shown. Similarly the note "grade drop severely" need to be replaced with top of new elevation. These are normally done by using the finished floor elevation at the house as reference point. The detail need to be corrected as noted in red. The metal deck is required to sit directly on steel beam and need to be welded. Nelson studs or DBA(deformed bar anchors) 1/2 inch diameter need to be welded to the top of steel. If DBA is used, it needs to bent at 90 degree towards the middle of slab. Rebar for this type of suspended slab is normally #4 bars spaced at 12 inch on center each way. The insulation that you have at the garage tells me the bottom of garage is exposed to weather. If that is the case, the steel beam need to be galvanized. On the other hand if you are going to build walls below the steel beams, you should use walls to support the slab in lieu of the steel beams. As for the strength of this design, 14ft wide is pretty narrow. Depending on the size of beam you use, this is pretty sound for the load you mentioned. Remember that the weight of the roof and walls above the steel beams need to be added to the design of the beams. The steel beam connection to the columns and/or footing need to be bolted with elongated bolt holes to allow steel beam movement due to thermal expansion and contraction during winter and summer months.